Pack everything you need for a day at the beach in just one custom tote bag with our large personalized beach bag. 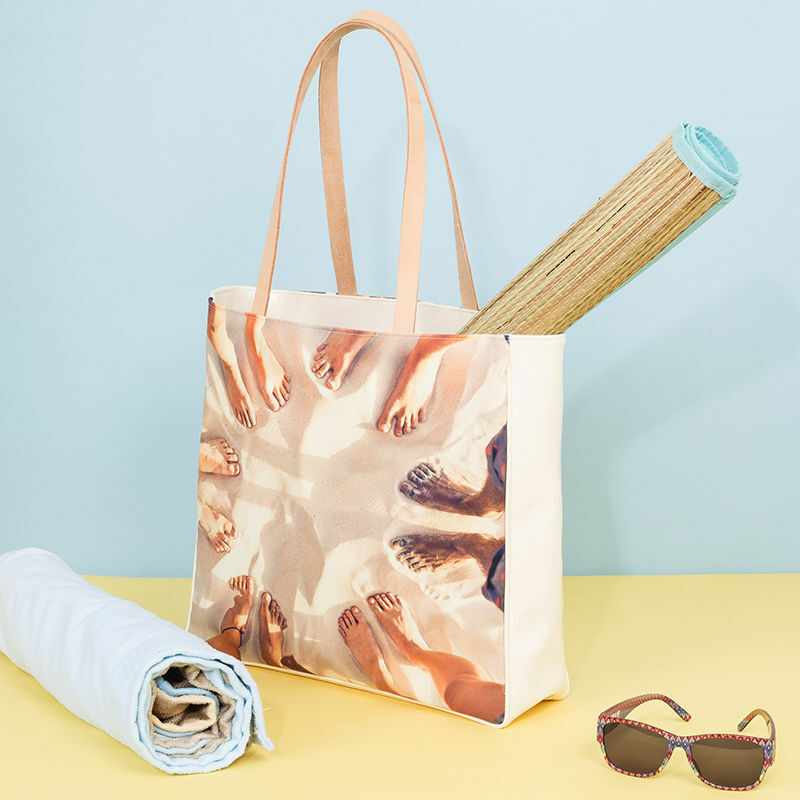 Design your own custom tote online and enjoy a day at the beach for full relaxation. Ideal for kids, families and even sporty beach outings with friends. Our personalized beach bag is the ultimate tote for all of your beach necessities. It's large enough to fit all of your gear and the inside is waterproof in case of any wet towels or sunscreen explosions. The custom tote bag is available in four trim colors (soft pink, black, pale blue, or ivory beige) and is made with long leather handles to fit easily over the shoulder. The canvas sides are custom printed with your design for specialized construction by our in-house production staff. Create your own large beach bag with this custom tote personalized with your photos or art. Very professional so far. I loved my bag. I want another one ! The bag I ordered FAR EXCEEDED my expectations! It looked GREAT!!! Love, love, love it so much and was so excited to give it as a gift! I will definitely order again and recommend to everyone I know! Both the exterior and interior surfaces are easy to clean, and the colors will not run. The sturdy canvas and vinyl will withstand the bumps and grazes of trips up and down winding paths to your favorite beach spot. Get your own personalized beach bag online today, whether is cute beach bags of your kids photos or an art print to adorn your custom beach bag to show of on holiday. Design custom tote bags online now in our easy to do online system, and use our collage maker app to design a collage tote bag for beach too. Care: Surface wipe with mild soapy damp cloth. No abrasion. 10 year guarantee, print and build quality on your personalized beach tote.